A Preston-based horticultural firm has invested in upskilling its workforce thanks to help from a £5.6m skills programme being delivered across the county. Lovania Nurseries has received help from the Lancashire Skills Support for the Workforce (LSS) programme to enable one of its staff members to access management training at Myerscough College. 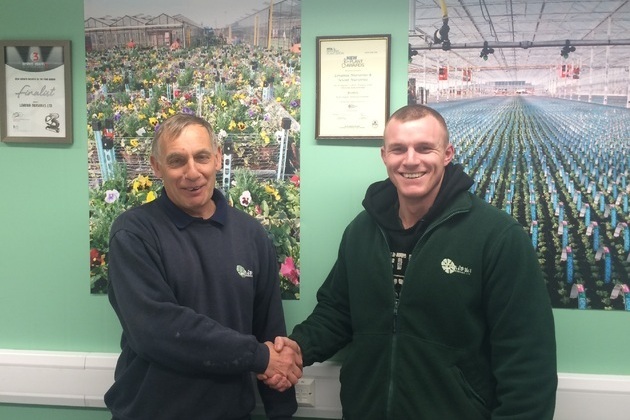 28 year-old Stephen Massam, who has recently completed an advanced apprenticeship in horticulture, is working towards an ILM level 3 in leadership and management. Peter Booth, head of growing at Lovania Nurseries, is very positive about the future of the horticulture industry and acknowledges the importance of training within the sector. He said: “There are all kinds of career opportunities in the horticultural industry and investing in training and developing our workforce of the future means we are sowing the seeds of the sectors success. LSS will support 3,817 employees aged 19 and over who are working in small or medium sized businesses and have a workforce of up to 250 employees. It will run until July 2015, with places allocated to businesses on a first-come, first-served basis. The fund operates across the Lancashire Enterprise Partnership (LEP) area, which consists of Lancashire, Blackpool and Blackburn with Darwen local authorities. Businesses looking to benefit from the programme can find further information and apply through a new website www.lancashireskillssupport.co.uk.